A way to play that’s more honest than the original. 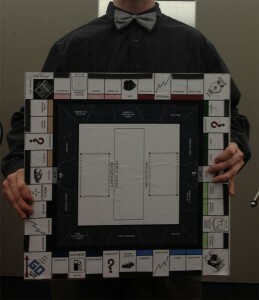 Modern Monopoly is reflection on modern day capitalism and the role of banking in the system. I started with the idea of making a more realistic version of capitalism than the rosy “anyone can be a Rockefeller” story that traditional Monopoly tells. I created a new board and system of rules that enforces different rules and privileges to those with more or less money. There are financial thresholds (cash & property) that determined if you were rich, poor, or middle class. One player would always start rich, one would always start poor, and the rest would start middle class. But if you gain or lose enough you can move from one class to another. In addition, rich players were afforded luxuries and advantages not available to the other players. The rich player gets a private viewing station with digital board and the banker takes care of all his financial transitions for him and gives private advice concerning purchases and strategy. Above all else, the bank serves help the rich player cheat. In the manual I created to give direction to whoever is playing the bank, I state this explicitly. There is also an inner track that is only advantageous for the poor player to navigate. There are numerous small opportunities for the poor player to get ahead, and dangers for the middle class and rich players if they ever go in there. It can be useful to escape paying rent, to duck into the slum, however, if you have money you are always at risk for robbery or worse.